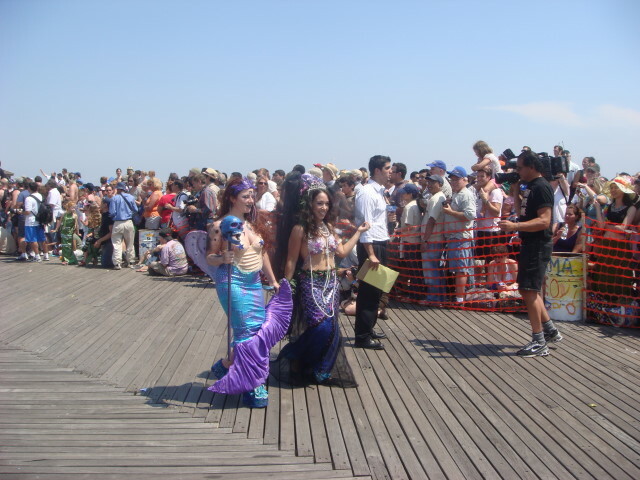 This is the second of at least four posts on the Mermaid Parade. As you’ll see, there’s really very little pulling this parade together. When I was watching it, I kept thinking of the supposed Winston Churchill statement: this pudding has no theme! The parade was the same way. It just seemed to be clever for the sake of being clever. But most of it wasn’t that clever. I don’t mind the exhibitionism, but that’s actually one of its only real charms. In keeping with that, I have to admit I love this next picture for all the wrong reasons. She just utterly ignored the crowd. I’m not sure, but I think she was making a phone call. 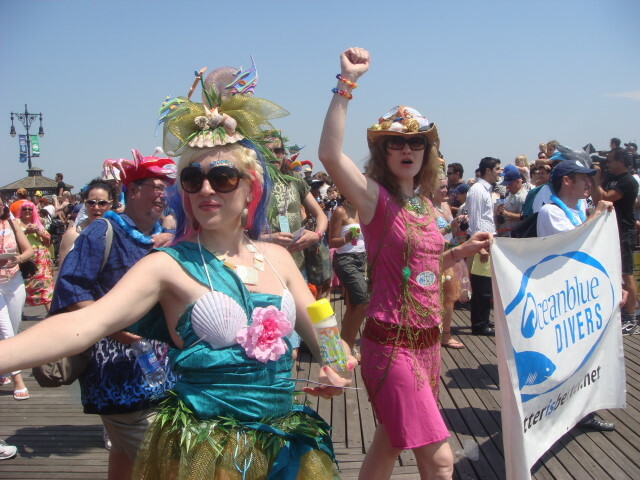 Hey, mermaid! We’re over here! 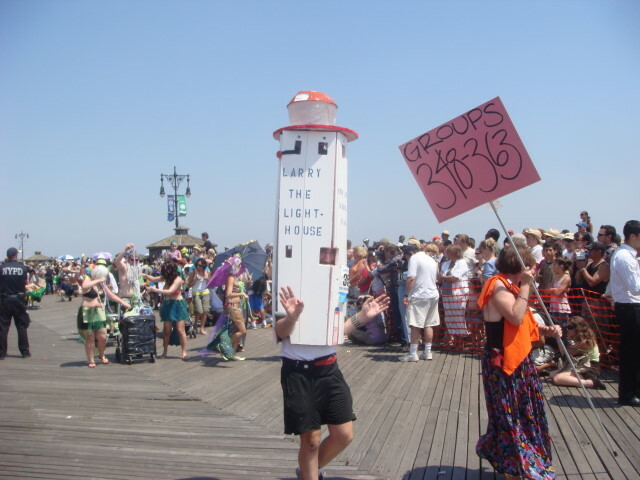 I don’t know if this is the real “Larry the Lighthouse” or an imitator. 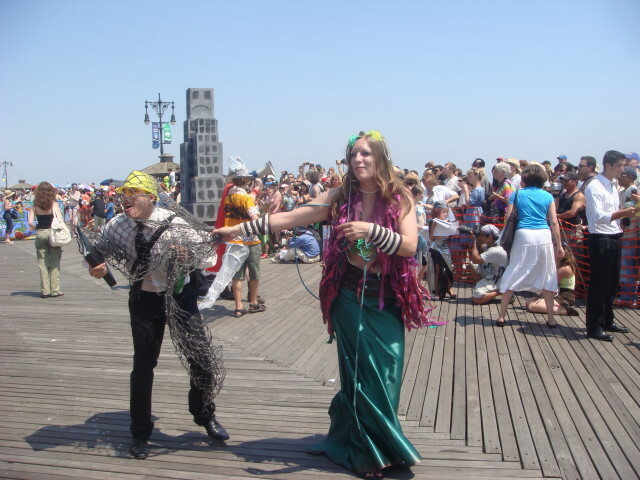 The next picture is that the most elusive mermaid: the mermaid with the head of a fish and human legs. Along with its more prosaic cousin. 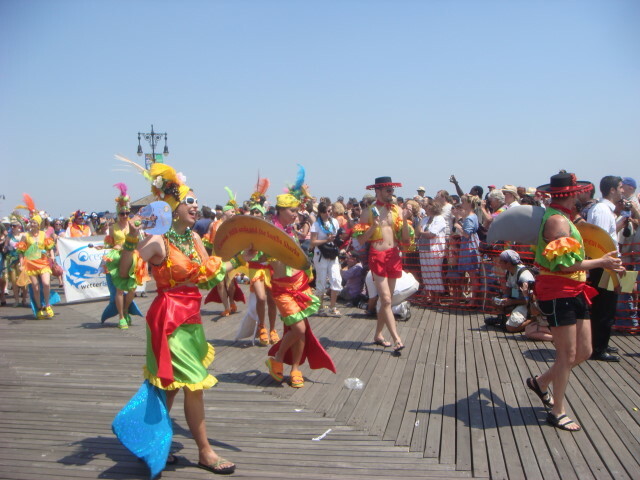 The next group called themselves “Carmen Mer-anda and the Samba Sharks”. Get it? Mer-anda – Mermaid? C’mon, folks. That’s just an excuse for the hats and not a clever take on anything whatsoever. Next came a group called Oceanblue Divers. I don’t know who or what they do. Or even if it is a real group. Well, they have a sign, so they must be real. So few groups were marked that I should just be grateful that three groups in a row did carry a sign. Thank you. Women with squirtguns. I don’t know if they are part of the group or not. This isn’t the Polar Bear Club, but it is the Winter Ocean Swimmers. The next bunch was a set of protestors. The below protestor was threatening something probably very near to the hearts of the crowd: Starbucks. 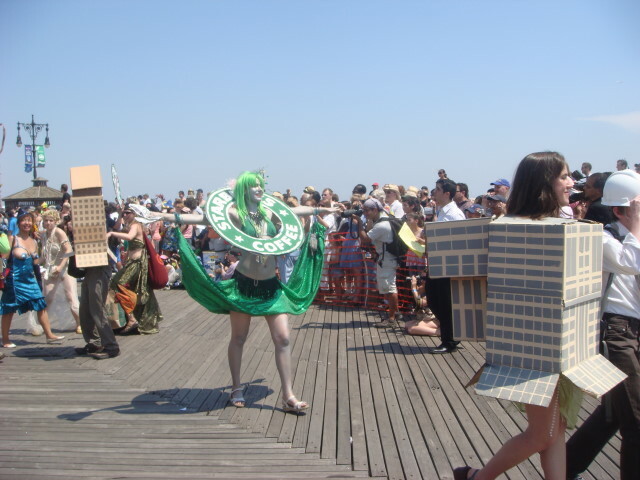 Anti-condo protest. 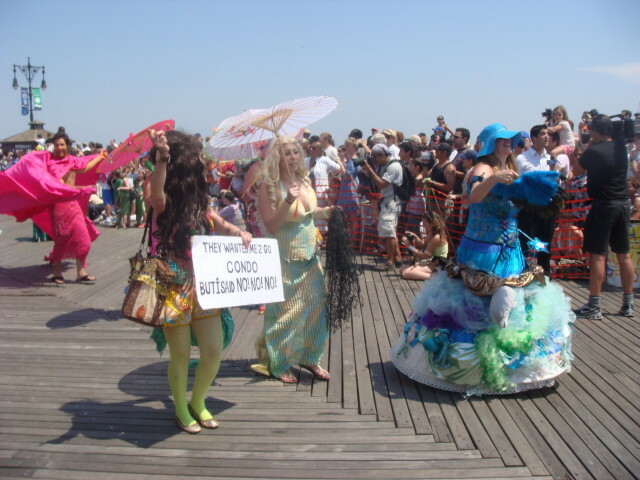 Coney Island is undergoing a major set of renovations and these ladies don’t like it. The next is a very subtle editorial by the protestors: evil capitalist threatening blonde. 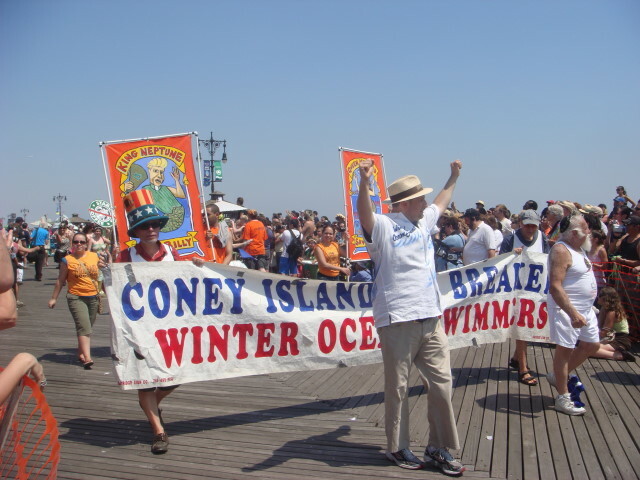 I’ve got a couple of these protestors pictured doing the same thing: sea creatures catching developers in a net and hauling them away to their doom. Symbolizing? Hey, is this a terrorist threat? Okay, I’m still mystified. This is part of the protest group. They have an octopus. 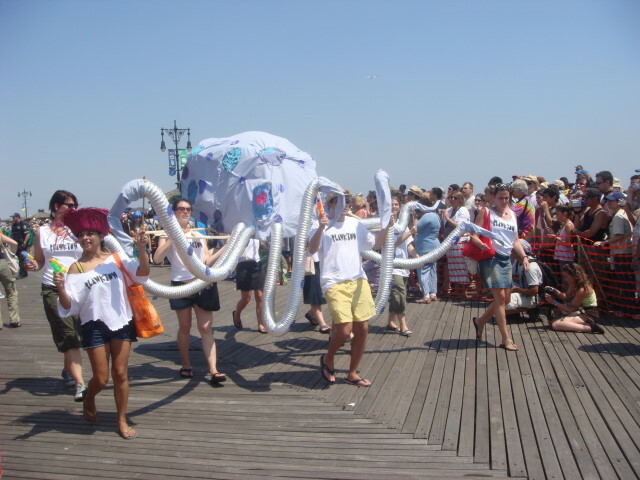 The people holding the octopus are labeled “plankton”. Octopi don’t eat plankton. 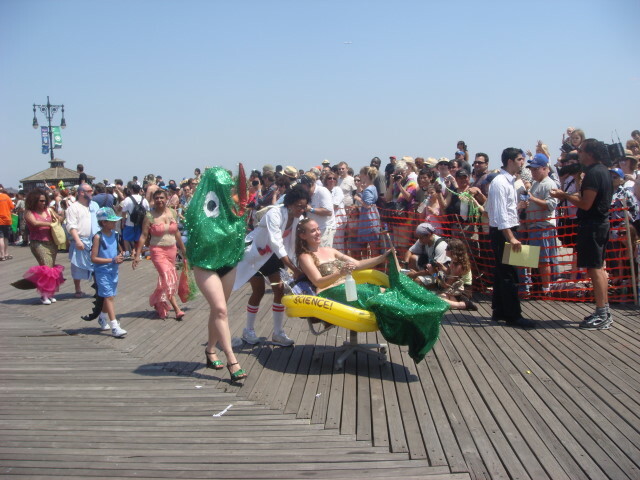 Why do the “plankton” carry squirtguns? What is this protesting? 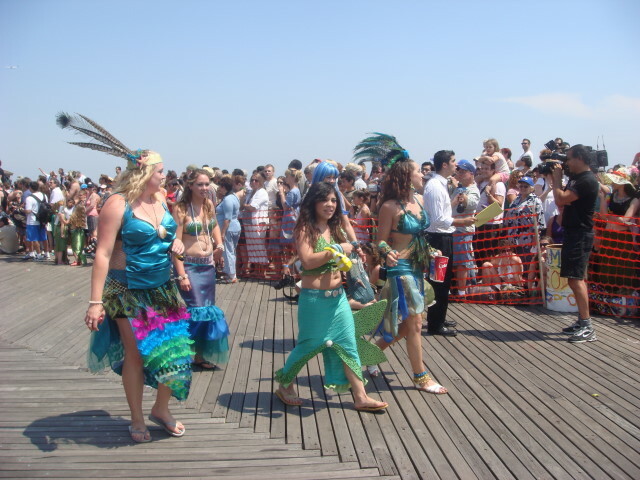 A summer celebration called the Mermaid Parade on Coney Island. Let’s have feathered headdresses! 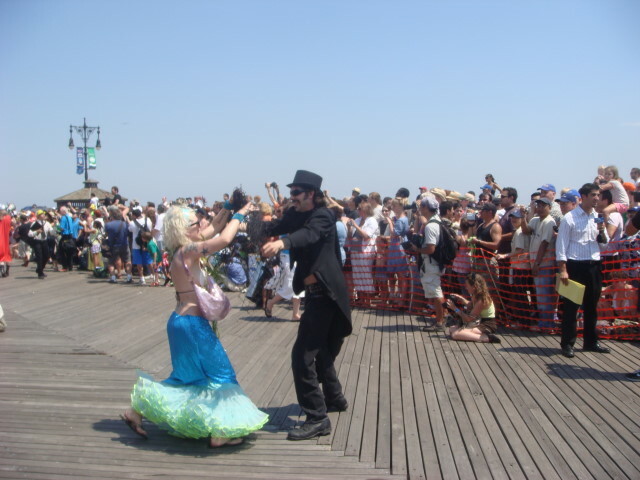 A marching band appeared (the West Village Sea Monster Marching Band). I usually sort of enjoy marching bands (more so when they are good at it), but having live music at any point was just fine with me. And, you know, I really don’t remember if they were real good. It was just good to hear music. 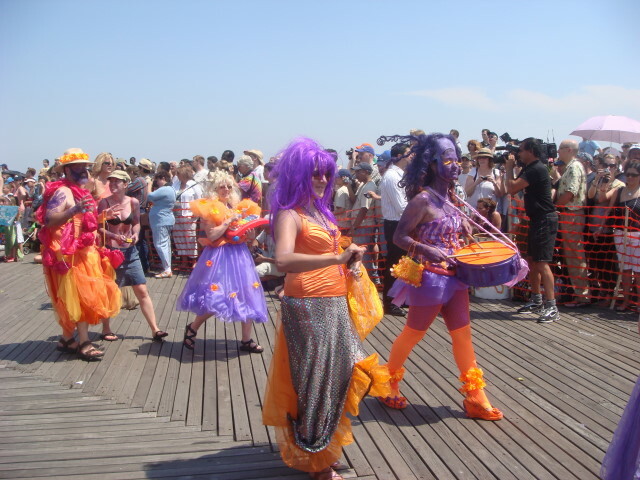 As you might expect from the West Village, they weren’t a regular high school marching band. 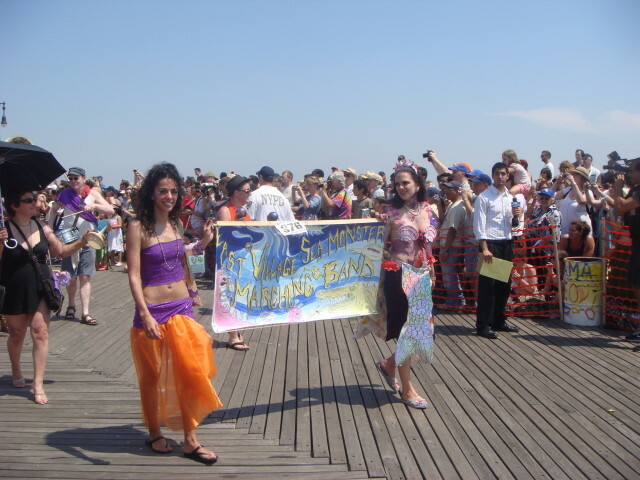 This entry was posted on June 23, 2008 at 5:59 pm and is filed under Events, Parades, Wanderings. You can subscribe via RSS 2.0 feed to this post's comments. You can comment below, or link to this permanent URL from your own site. We are actually the East Villiage Sea Monster Marching Band. Glad you appreciated us!